This winter has been one snowy adventure after another! This morning, the farm was at the coldest temperature the boys and I have ever seen, -15, which beat last week’s coldest of -14. Mr. Montana, my husband, has seen much colder weather, of course, but when he was snowed in with us on a work day and we were in an all out “snow squall”, what I call a “blizzard” thanks to my childhood filled with Little House books, I cracked up when he stood at the window calling me out of my cozy recliner. I tried to look, but all I could see on the other side of the window glass was white. It was crazy! And kind of fun, since we had lost power earlier that morning, but had it quickly restored by a very efficient, fast-acting power company worker. 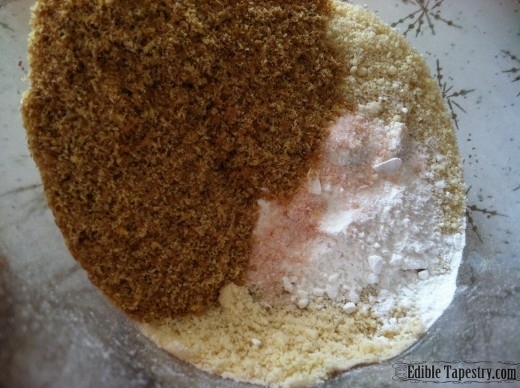 This morning when I was standing at my kitchen prep table with the intention of getting some baking done for the upcoming winter blast, I was confused when the kitchen floor below my feet started to rumble. The big dinosaur diesel furnace in the root cellar had kicked on. We didn’t even know if it still had fuel in it, but as it turns out, the thermostat was set to 45. When our outside temperature brought the inside of the house down to 44, the old dinosaur woke up and did what it was supposed to do. We cranked it up to 55 and had a nice, cozy living room while we waited for the freshly loaded outside wood furnace to get cooking. It was so nice to have warm toes while I sat and drank my coffee that next year we are going to make sure our dinosaur has plenty of feed for days like these. Or maybe it’s a dragon and we should call him Puff, because that was some magic he worked this morning! So far, my fruit cookies are a hit. 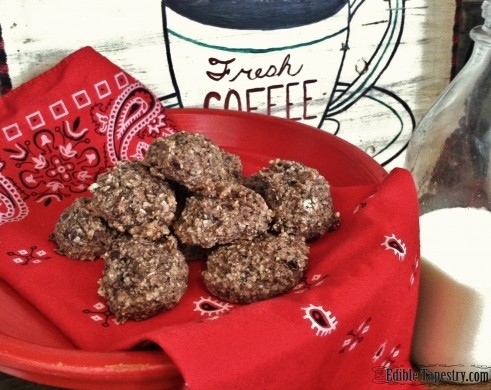 Mr. Montana had to leave for work before the first batch was pulled out of the oven, but since he loves Fig Newtons I think he’s really going to like the ground raisins and chia seed crunch that reminded me of fig seeds the first time I bit into one of my breakfast cookies. Heat oven to 350 degrees. 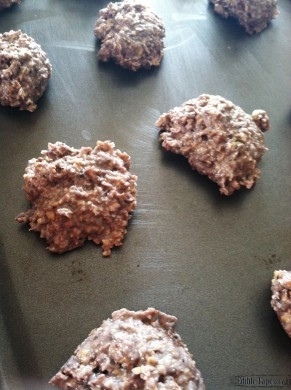 Grease cookie sheets with coconut oil. 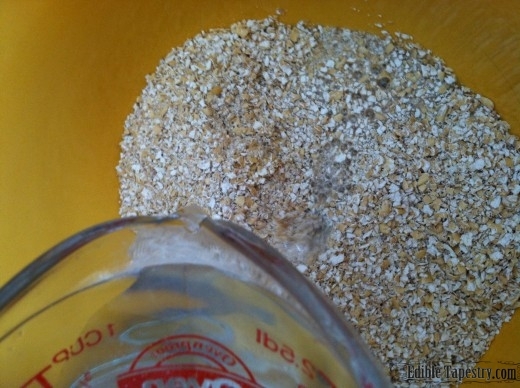 Pour the water over the oats to soak for 1o minutes. 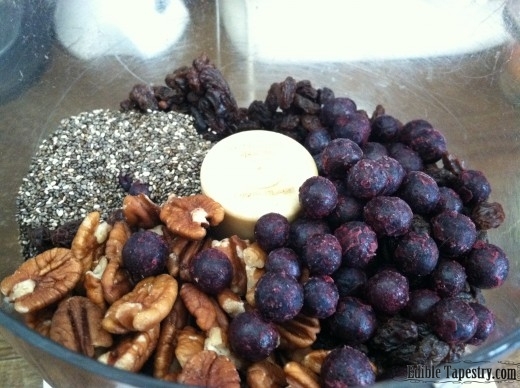 In the bowl of a food processor, grind together the nuts, raisins, blueberries, and chia seeds. 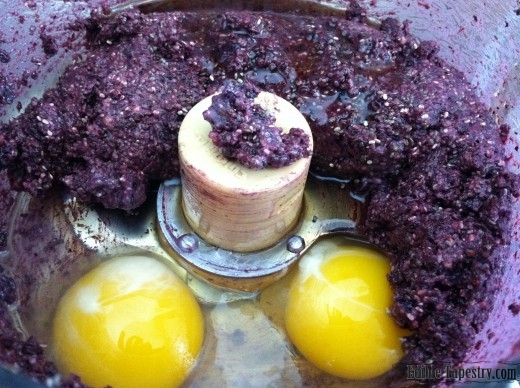 Blend in the maple syrup and the eggs. 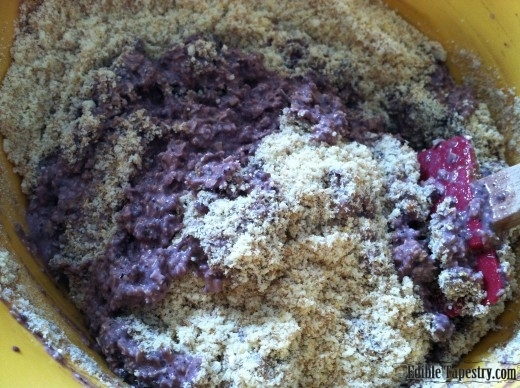 Sift together the almond flour, flaxseed meal, salt, and baking powder. 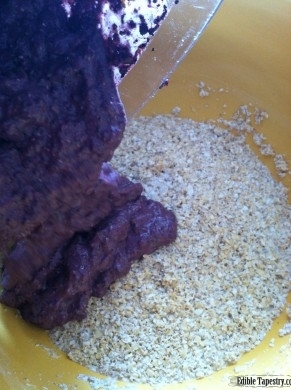 Combine the processed fruit, seeds, and nuts with the soaked oats. Funky purple!! 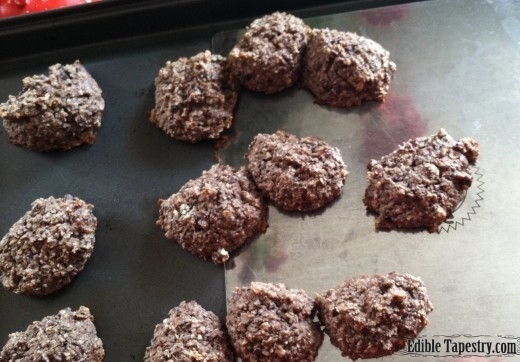 Drop by level tablespoons onto the greased cookies sheets. 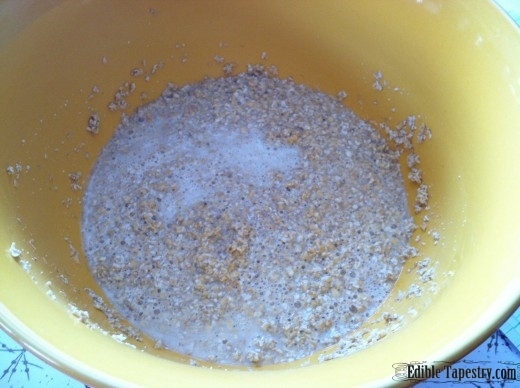 Bake 12 minutes. Transfer to cooling racks. 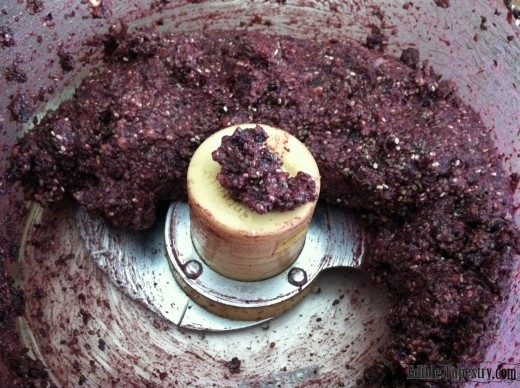 « Duplin Easy Muscadine ~ It’s National Drink Wine Day!